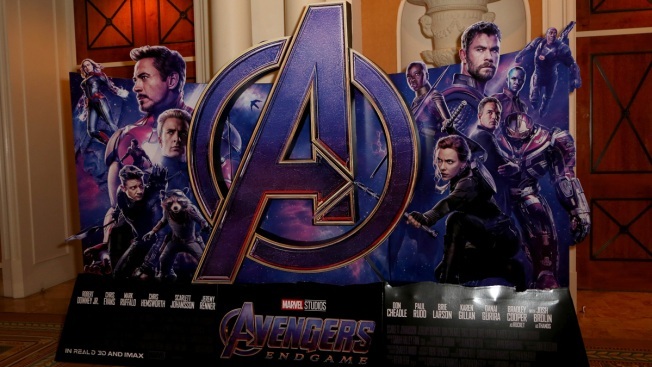 An advertisement for the upcoming "Avengers: Endgame" movie is displayed at Caesars Palace during CinemaCon, the official convention of the National Association of Theatre Owners on April 01, 2019 in Las Vegas, Nevada. On Atom Tickets, “Avengers: Endgame” has sold three times more tickets in the first hour of sales than “Infinity War” did last year. "Avengers: Endgame" on Tuesday crushed Fandango’s first-day U.S. sales record (previously held by "Star Wars: The Force Awakens") within the first six hours of presales. Advanced tickets for the 22nd film in the Marvel Cinematic Universe went on sale Tuesday morning, and fans flocked to presale ticket websites like Fandango and Atom Tickets. "We’ve never seen anything like this — it’s truly a groundbreaking accomplishment – as fans simply cannot wait to see how this epic saga comes to a close," said Erik Davis, managing editor of Fandango. "Endgame" is due in theaters on April 26. The film is expected to finally give some resolution to the events of "Infinity War," in which half of the heroes disappeared into dust. It could possibly serve as the last film for several of the actors who donned the mask, cape or shield of Marvel’s most iconic characters. "Avengers: Infinity War" brought in $678 million domestically and $1.37 billion from international markets on its way to becoming the fourth-highest grossing film of all time. On Atom Tickets, "Avengers: Endgame" has sold three times more tickets in the first hour of sales than "Infinity War" did last year. It set a record on the site for the best first hour of presales.